I absolutely love this Sweet Chai drink from Higher Living, I have switched from drinking normal tea with milk to having Sweet Chai a couple of times a day as it is just so nice. 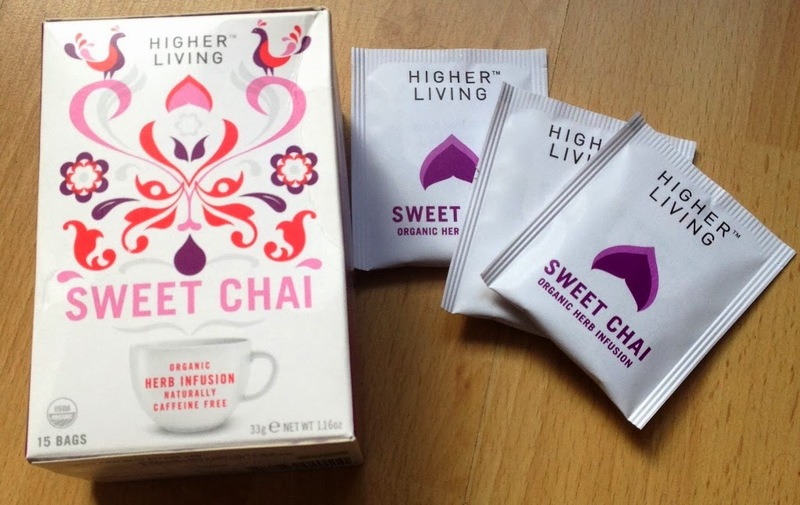 Sweet Chai from Higher Living is an Organic Herb Infusion which is naturally Caffeine free. Ingredients - Licorice, Fennel, Anise, Peppermint, Ginger, Cardomom, Cloves, Black Pepper. To try it properly I made it a few different ways to see which one I liked best, I tried making a chai latte with milk. It was nice enough but the flavours didn't come through enough for me. I tried it with almond milk which was ok as well. However, the way I liked it best was just the bag, left to brew in freshly boiled water for 5 minutes. The full beautiful chai flavours and taste come through. Pure and simple. This drink is quite different to what I normally would opt for so I was surprised at just how much I did like it. Spicy, a tiny bit peppery but with a gorgeous sweetness that consumes the mouth as an aftertaste. If you like sweet things this hits the spot nicely. Actually what I liked most about it was that each sip potentially could taste a tiny bit different from the one before. Very, very nice, I already plan to restock. Look out for a couple more Higher Living reviews....coming soon.